With the spring comes a resurgence of farmers’ markets. Local farmers have been planning and growing and are now ready to bring their seasonal produce to town commons, squares, and gathering places across the region to enjoy with our families and neighbors. The experience of going to a farmers’ market exceeds the basic transaction of purchasing fresh vegetables. Farmers’ markets are places that bring a community together, affording the opportunity to support local agriculture, make healthy food choices, share stories, and connect with neighbors and farmers. Farmers’ markets are community builders, the American version of the European plaza, and are intrinsically a part of our New England culture and traditions. In Western Massachusetts, many farmers’ markets have expanded to not only include agricultural products but to also provide a space for local artists, crafters, performers, and teachers to make their services, knowledge, and products directly available to the community. This type of collaborative consumption allows community members to support small businesses and individuals that directly affect the health of a small town’s economy, promoting sustainability and resilience at a local level. Additionally, some farmers’ markets host spaces for instructors to lead workshops on topics related to homesteading, nutrition, and cooking. The opportunity to learn at farmers’ markets through intergenerational skill-sharing makes them an important community-based educational resource that brings people together via shared interests. 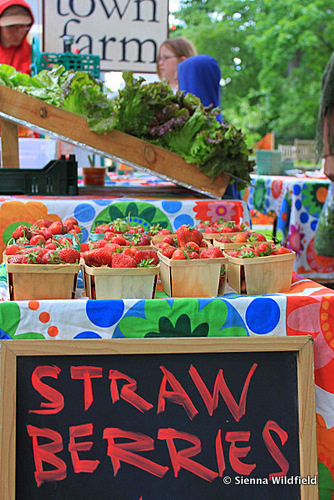 Where are your local farmers’ markets or farm stands? Check out Community Involved in Sustaining Agriculture’s (CISA) website and see when and where they are happening. Their website offers many resources for both consumers and farmers to help sustain agricultural enterprises in Western Massachusetts. Additionally, their outreach efforts include workshops and informational sessions that highlight the importance of supporting local food security in our region.